When I was growing up, I lived in a very small town out west on the border of New Mexico and Arizona. It was a farming town. The kind of town that everyone literally knows everyone and kids can run safely in the streets. The kind of town where there are dirt roads and no stop lights. The closest large grocery store with variety and ALL the items you need is Walmart and a Safeway, which is a hour drive away. A town where one of the most exciting things of the year is to sit on your porch and watch bicyclers from around the country ride in a race called the "Javelina Chase" (pronounced ha-va-lena chase). This is so exciting because there are actually people doing something interesting and they are FOREIGNERS ! (even if they are literally just from northern Arizona or New Mexico) I grew up in a REALLY small town that most people don't understand, until they go and spend even a week there. My family is a large family. Although we were surrounded by farms, my parents were not farmers. My dad worked as a accountant for the local copper mine that literally was the workplace for about 80% of the town and the surrounding towns as well. If you didn't work at the mine, you were a farmer. Lunts and Jones were the farmers for basically---ever. My mother did foster care, which is why our family grew in numbers after I hit 5th grade. Even though my family didn't farm, we did own a garden and my brother and I raised pigs to show in the fair for extra money. We started working as soon as we were strong enough to push a lawn mower. We would have to wake up super early to pull weeds and read scriptures before dad went to bed. We learned to work early in our lives. In junior high my sister and I cleaned houses for a bit of extra income and often times we would babysit our cousins up the street. In high school, I moved out of my house and helped a family who I have come to love and call my 2nd family. I assisted the grandma during her Alzheimer stage, and the mother with her house keeping. Later I helped nanny one of the daughters children. By the time I hit college, I had scholarships for school and had bought my own car and cell phone. I`m only giving you a bit of a background on my life to show that I had a childhood not like a lot of youth and especially different from the youth of today. When I go home, I am so shocked at the difference of how I was raised in comparison to the way my niece and nephew are being raised. (Not just because my parents are getting old) We didn't have TV so I only watched movies on occasion with the family. My dad was big on education and read a lot of books. He was a musician so we watched musicals on cassette. Later we did get into DVDs and now we have lots of those! My mother read a lot too. I would often find her in bed reading something like Agatha Christie or some mystery. I loved to read as well. I also was really active in school so sports and clubs kept me busy. TV was never really a temptation. Since getting older, I still rarely watch TV. On occasion I`ll find a show I become hooked to like Poldark from the BBC and PBS Channel. But I find myself filling my time with other things like working out, starting businesses, doing coursework for my education, working, and now blogging! There are still a lot of times in the day where my mind finds time to wander into pity mode and think of all the things I don't have that I want. It's during those down times that I realized I needed to find a distraction that was productive and still helped me reach a goal so I felt accomplished. READING! What could be a better distraction than a good book? I have to say I am loving listening to books and also reading them while I travel. My commute is very long and not having a car these days has really connected me to public transportation. I hate wasting time! Sometimes commutes frustrate me because 3-4 hours of my day are spent trying to get from one place to another. But now I have filled those hours and minutes with something that literally energizes me. My conversations can become more interesting and I have something new to think about everyday. I also find myself feeling less lonely as the characters in the book become my new friends. Books really are wonderful! I have been cramming my library full of running books and thought that on occasion I might want to read something in addition to biographies, memoirs, marathon stories, and training books. So I signed up for The ﻿Book of the Month Club! 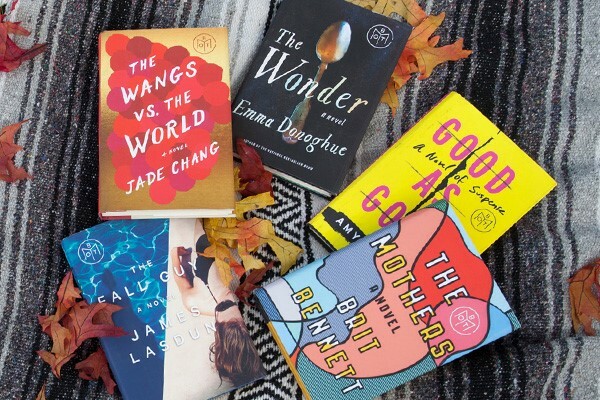 How this club works is on the first of each month, they announce five monthly selections, carefully chosen after they pour through thousands of books and feel they have found the best ones! You choose which books you would like to receive by the sixth of the month, or easily skip the month if you prefer. Your membership comes with 1 book each month but you can add additional books for $10. This is a great way to try new reads and build up your library slowly for a great price! You can also join a discussion board on each month's books and share your insights as well as get the feels for the books you may have not chosen! Join the new addiction! :) Sign up for the Book of the Month Club! I`ll be getting my first book soon and OF COURSE I`ll be sharing with you what I have chosen and my reading experience! Don't forget to come back and share with me what you are reading in the comments section. Also, check out @she.runs.this.world on Instagram for more running and reading inspiration! Try it today for $5 for 1-month memberships with code BOTM5! Year membership only $11.99/ month!